Old IC (integrated circuit) packages are fun and I collect them. This involves going to flea markets to look for cheap vintage electronics like telephones, answering machines, radios or toys, and then desoldering and salvaging all the ICs and other interesting parts. Selected packages from my disorganized pile of chips follow. Most are POTS-related. A "one-chip-wonder", this is an FM/AM radio in a small package. It takes an RF signal (from the antenna) and an IF oscillator frequency as inputs and outputs demodulated monaural audio. This chip does general answering machine related tasks. It has a tape preamp for recording and playback; voice detector logic; beep detection using zero-crossing comparation; power amplifier; line amplifier; and pins for interfacing with a microcontroller. The UM91215C is a tone/pulse dialer. A telephone keyboard matrix is connected to the input pins, and the chip outputs DTMF-encoded audio or pulsed digits, depending on the selected dialing mode. An external oscillator needs to be connected as well. It can do a one-key redial of the last dialed number, and it can also flash the phone line. A DTMF receiver, reversing the operation of UM91215C above. The chip, employing filters and zero-crossing detectors, is fed an external oscillator frequency and telephone line audio, and it outputs a four-bit code corresponding to the DTMF digit present in the signal. The use of external components is minimal, but a crystal oscillator is needed in this case as well. A speed regulator for DC motors, this chip can keep a motor running at a very stable speed under varying load conditions. In an answering machine, it is needed to keep distortions in tape audio in the minimum. This chip can store and play back a total of 16 audio recordings of 512 kilobits in size. It also contains a lot of command logic, explained in a 40-page datasheet. Type of audio encoding is not specified, but the bitrate can be chosen between 22kbps and 16kbps. The analog output must be filtered prior to playback. 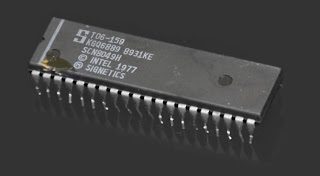 This monster of a chip is a 6 MHz, 8-bit microcontroller with 17 registers, 2 kilobytes ROM, 128 bytes RAM, and an instruction set of 90 codes. It's used in many older devices, from telephones to digital multimeters. Never really understood what a DC motor controller is doing. Is it just a very constant DC-voltage-output regulator, or does it do more? It is sort of a voltage regulator, but not in the way that you're thinking. Actually it's sort of a combination voltage regulator and op-amp. It conducts current on the low side of the motor, but it also has a sense pin on the high side, and with the network set up right, it cancels out the voltage due to the actual motor current, leaving the low-side regulator to drive the motor back-emf to a constant value. And the back-emf is directly proportional to motor speed, so that amounts to driving the motor at a constant speed. Motors are bidirectional machines: if you load them, they either stall or require more power. Hence, a constant voltage drive definitely can not do the job, but you need to monitor the rpm.